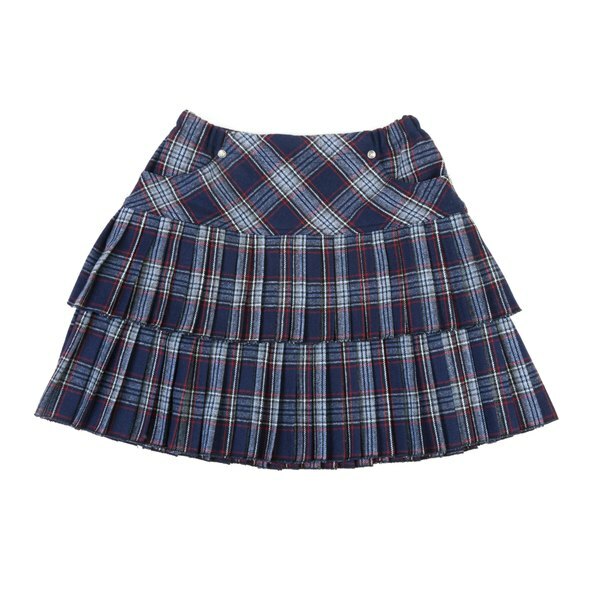 Put on a plaid mini skirt for your Rachel Green-inspired look. Rachel Green, the bubbly waitresses turned Ralph Lauren designer on the 1990s-2000s hit sitcom "Friends," had a distinctive style. Portrayed by Jennifer Aniston, Rachel's trademark was her hair, making the "Rachel" cut highly sought by women nationwide. Break out your favorite fashions from the 1990s and early 2000s to create a look that pays tribute to Aniston's Rachel Green. "Friends" ran on NBC from 1994-2004, and loyal viewers know that Rachel Green's fashion evolved over that decade. So, when choosing the right Rachel look for you, consider what era you want to pay tribute to. Embrace mid-1990s fashion with a few key pieces that were staples in Rachel's wardrobe. In early "Friends" seasons, Rachel often wore short plaid skirts paired with knee-high socks and a sweater or button-down shirt. Throw an apron over the skirt to transform yourself into on-the-job Rachel Green, working at Central Perk. Other casual mid-'90s Rachel looks include denim overalls with a white tank top or a sleeveless flannel button-down top and high-waist jeans. As Rachel Green and "Friends" entered the 21st century, her wardrobe evolved as well. The character replaced more casual waitress wear with more professional attire featuring fitted pencil skirts, sleeveless tops and high heels. Rachel's more casual 2000s looks blended classic comfort with feminine touches -- think cargo pants and a spaghetti-strap silk floral shirt. Rachel always had a touch of casual bohemian style, so relaxed, flowy maxi skirts with fitted tank tops or mini floral sundresses also honor her "Friends" style. Accessories can put the finishing touches on your Rachel Green look. Chunky shoes -- think Dr. Martens -- were popular during the "Friends" era. The trend-setting character embraced these shoes, pairing them with plaid skirts and tights. She also wore knee-high boots with her mini-skirts. When choosing jewelry for your outfit, focus on simple pieces, such as stud earrings or a sterling silver necklace, when creating a Rachel outfit. From time to time, Rachel added pieces of menswear to her decidedly feminine attire -- a loosely knotted men's tie pays tribute to one of her more unique looks. Rachel Green is well known for her gorgeous dirty-blonde locks. During 10 "Friends" seasons, Rachel had a number of hairstyles, so you can recreate one no matter your hair length. Honor the once-famous Rachel cut if you have layers. Part your hair on the side, work some styling mousse into your tresses and blow out your layers for serious bounce and volume -- the bigger, the better. If you have long tresses, part your hair down the middle, and flat iron it for a sleek look. Or, style your short hair into a bob to recreate Rachel's shorter locks from "Friends" seventh season. What Is Steampunk Style Clothing for a Woman? Why Did Women Cut Their Hair to Become Flappers? How Can I Stop Being Obsessive Over My Boyfriend? How Did Men Dress in the 1960s?